The perfect balance of coffee and sweetness, tiramisù appropriately translates to “pick-me-up." The decadent Italian dessert is traditionally made with ladyfingers dipped in espresso, layered with a rich creamy mixture, and finished with a generous sprinkling of cocoa powder. Culinary legend has it that tiramisù was invented in Treviso, a small city in the romantic region of Veneto (supposedly to caffeinate the Venetian lovers!). Today, the classic dolce is made across Italy in a variety of ways; many of our colleagues claim that their family's is the best recipe. However, at Eataly, we know that at least one probably is right! Eataly USA Head Pastry Chef Katia Delogu created this classic recipe, which is simple to make and hard to beat. 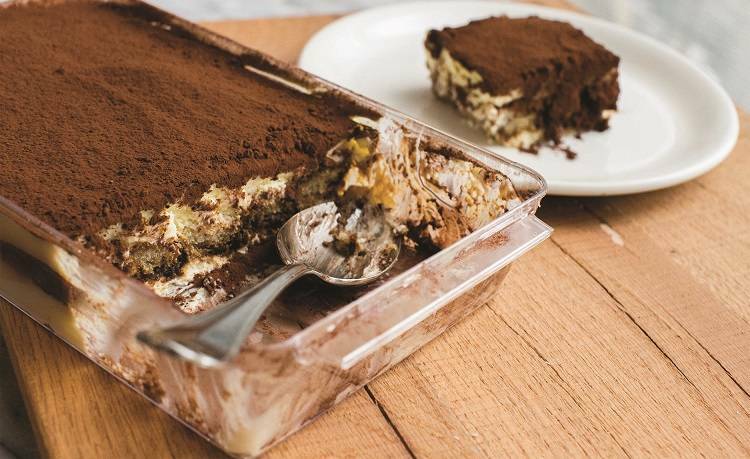 Get our tiramisù recipe below, then don't miss World Tiramisù Day on Thursday, March 21, 2019. Find your local Eataly to discover complimentary tastings, special offers, and more throughout our marketplace. Separate the egg yolks from the whites into two different bowls. Stir the yolks with the sugar and mascarpone until the mixture is pale and sugar dissolved. Separately, whip the egg whites until stiff peaks form. Using a wooden spoon, gently fold the egg whites into the mascarpone mixture, and then gently fold in the whipped heavy cream. Pour the coffee into a wide bowl, and quickly dunk each cookie into it. Arrange about half of the cookies so that they completely cover the base of a shallow (1½-inch deep) rectangular (11-by 7- inch) dish. Cover the cookies with half of the mascarpone mixture. Arrange another layer of soaked cookies, and top with remaining mascarpone mixture. Sprinkle with cocoa powder on top. Cover the dish with plastic wrap, and refrigerate for 4 hours before serving the sweet Italian pick-me-up.